(Seychelles News Agency) - A vessel belonging to the Seychelles’ Island Developing Company (IDC) that had been stuck on a sand bank for weeks moved off the bank on Aldabra early on Monday with the help of the high tide, said a statement from the company. The freeing of the stranded vessel -- Enterprise II -- comes as the world looks to the heavens to spot the so-called supermoon, a full moon that is especially close to earth this month, which contributes to an extra-high tide. 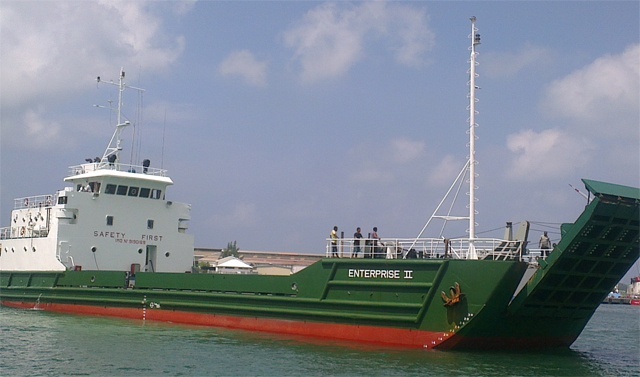 Enterprise II got stuck on October 19 after it had discharged 160 tonnes of construction materials which will be used for a cyclone-resistant building on the atoll. IDC’s Public Relations Manager, Michael Payet, said shortly after the vessel got stuck that Enterprise II went ashore on Aldabra on October 19 while the tide was two metres high. Such a big vessel can only approach the shore when the tide is at that height, he said. Payet had said that while the unloading of its cargo was completed on the same day, strong winds and current forced Enterprise II onto a sandbank as it attempted to leave. The 13 crew members, who were being accompanied by two military officers for protection, are safe and sound, the statement said. After leaving Aldabra, Enterprise II sailed for Assumption to discharge fuel. It is expected back in Seychelles Port Victoria on November 21. The tug boat which was dispatched by the port authority on November 11 to help salvage the vessel is returning to Mahe, the main island. Enterprise II is the main vessel of the IDC, a parastatal company, which manages some of the outer islands of Seychelles – an 115-island archipelago in the western Indian Ocean. The vessel is used by the company to sail to the outer islands on a quarterly basis to discharge fuel oil and other provisions.